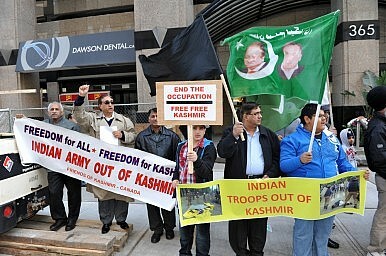 Unidentified protesters gathered outside the Indian Consulate in Toronto, Canada to protest the actions of the Indian Army in Kashmir (October 30, 2011). Britain’s vote to leave the EU has sparked calls for “Kexit” — India leaving Kashmir. In 2008, Kashmir’s pro-independence leadership were buoyed by the Caucasian breakaways. Popular pro-independence leader Yasin Malik called it “a psychological inspiration for the suppressed people of Kashmir” in an interview with me at the time. Then came referendums in South Sudan (or Sudan’s Kashmir) in 2011 and in Scotland, further cementing the resolve within the pro-independence camp and their massive following. The pro-independence and pro-Pakistan leadership led massive protests in the summers of 2008 and 2010 — much bigger than those the world saw in Egypt’s Tahrir Square or, indeed, anywhere during the 2011 Arab uprisings. At the same time, social media in Kashmir was picking up the pace. This week’s Brexit poll in the United Kingdom has offered a fresh impetus to the struggle within disputed Kashmir. Echoing Britain’s recent vote to leave the European Union — called Brexit or “British exit”– there are calls for a”Kexit,” “Kashexit,” or “KashOut” — all meaning an Indian exit from Kashmir. As referendums pile up around the world, hopes have risen of finally having one in Kashmir — a cause of significant tension between nuclear-armed Pakistan and India, who have fought two of their three major wars over the disputed territory. The hunger for independence or the right to self-determination in Kashmir is older than the 1947-shaped geographical entities of Pakistan and India. These modern countries were not even a dream in the early days of Kashmir’s existence, and its fight against oppressive rulers. Looking at the modern history of Kashmir, Kashmiris have not ruled their region since their last king, Yusuf Shah Chak, was defeated in the 16th century. Muslim-majority Kashmir passed to the Mughals, the Afghans, and then the Sikhs. And when the British defeated the Sikhs, Kashmir automatically passed into the British Empire. But in its quest to defeat Sikhs, the British forces were aided by the Hindu Dogras, ruled by Ghulab Singh. For his help, the British sold Kashmir with its people for mere 7.5 million nanakshahi rupees to the Hindu ruler in 1846. Along with the money, the deal also included one horse, twelve goats (six male and six female), and three pairs of cashmere shawls. That was the price for which Kashmir’s lakes, mountains, fine springs, and Chak’s people passed into the hands of Hindu Dogras. This notorious sale remains etched in the collective awareness of people. Kashmiris were effectively sold in what could be one of the biggest slave trading deals in history. For the Kashmiris, it meant more tyranny at the hands of Hindu rulers. Kashmiris were taken to begarie (forced unpaid labor), mostly to the frontiers of Gilgit-Baltistan, with most of them dying in the mountains and never returning. Heavy taxes were levied on farmers and orchardists. Very few could own lands; most Kashmiris worked as petty peasants. In one devastating plague, half of the population of Srinagar city perished. All the dead were Muslims, despite a significant population being Kashmiri Hindus too. The ruler’s army drowned those who tried to escape the calamity in Wullar Lake in the north. The Indian army was supposed to bring order and allow a plebiscite as promised by the Indian Prime Minister Jawaharlal Nehru. Instead India decided to station its troops in Kashmir permanently. While India controlled the princely region of Kashmir, it absorbed southern Muslim-majority Hyderabad, another princely state, by sending troops there. India forced a referendum in another bitterly contested region, Junagadh, and won the case in the Hindu-majority region. Between these events, India also took the Kashmir dispute to the United Nations, but backed off in the face of over a dozen UN resolutions calling for a referendum in the region (resolutions, incidentally, which the United Kingdom also signed). The U.K., a mature democracy, worked hard to solve the Northern Ireland dispute, allowed a Scottish referendum, and now has decided upon Brexit. Similarly, Kashmiris believe that the U.K. has a moral responsibility to help solve the Kashmir dispute, because it sold out the Kashmiris and left the dispute festering again a century later in 1947. Indian analysts often point to the conditions of a UN-sponsored plebiscite, arguing that Pakistan needs to pull back from its administered region first. That’s a fair point. Islamabad has always said it will pull back from the region if India follows suit. This call was made in 2003. Again in 2007, Pakistan’s powerful dictator General Pervez Musharraf offered to demilitarize both sides of divided Kashmir. New Delhi rejected both offers. The civilian government in Pakistan has often backed plans that call for Kashmir’s complete independence from both countries. Former Foreign Minister Hina Rabbani Khar, in her latest interview to Al Jazeera, endorsed the choice of an independent Kashmir, saying her country will have no problem. Mohammad Umar Baba (Byline – Baba Umar) is a Kashmiri journalist based in Middle East. He is a 2016 SAJP Chevening fellow and often writes on politics, conflict, human rights, and the environment. He can be reached at @Babaumarr.